Once known as the White House "hatchet man" during the Nixon administration, in 1973 Charles Colson experienced a life-changing transformation when he gave his life to Jesus Christ. While serving in prison on Watergate-related charges, God gave him a new vision and purpose for the rest of his life. 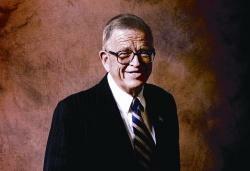 In 1976, Chuck Colson founded the Prison Fellowship Ministry, which has become the world’s largest outreach to prisoners, ex-prisoners, crime victims and their families. Today Chuck has an extended ministry as an evangelical thinker and statesman. He is a radio commentator for "Break Point," a nationally syndicated broadcast. He is the author of 24 books; his most recent book is The Faith: What Christians Believe, Why They Believe It, and Why It Matters (Zondervan). Preaching editor Michael Duduit recently sat down to visit with Chuck. Preaching: Chuck, thanks for taking time to visit with the pastors who read Preaching. Colson: Well, I’m excited to because I have a real heart for pastors. I realize the tremendous job they have. I watch my pastor week after week preach faithfully and realize that they’re really shepherds of the flock for whom Christ gave Himself. And so you have to realize—the way Paul described it—that that is a very high, noble calling. Preaching: We were excited to have you serve as the keynote speaker at our recent National Conference on Preaching, where we dealt with issues of faith and culture. Do you think there is a place for Christian preachers to engage the culture in the areas of politics, entertainment, the arts? Colson: I love what Abraham Kuyper—a great Dutch theologian who went on to become Prime Minister—said when he dedicated Free University in Amsterdam at the end of the 19th century. He said, "There’s not one square inch in the whole domain of human existence as to which Christ who is sovereign over all does not cry out, ‘Mine!’"
And my opinion is, if Christ calls out, "Mine!" over every square inch of human existence, the church has to call out, "His!" We have to be concerned particularly with the transcendent moral issues of our day. There’s no way you can ignore it. I know there are some churches that like to not get involved. I was recently in a stimulating debate with a fellow who said we should just tend to building the Kingdom and let politics take care of itself. Well, you could do that if you didn’t take the view of the lordship of Christ that I do. I believe that God is sovereign over all. "In the beginning was the Word, and the Word was with God and the Word was God." The "Word" in Greek is logos, which means all truth that ever could be known or was known to the Greeks. That’s how the Greeks used it. John was a Greek, so he understood it fully. Jews often translated it as "the mind of God Himself." So if that’s true—if Jesus is not only the Redeemer who came to earth to die on the cross in our place but is also the Logos, if that’s the explanation of who Jesus is—then He is also Creator. Therefore we have to be concerned with how the gospel interfaces with everything. You can’t preach today without caring about the workplace, when so many of your people are there all week. You’ve got to be preaching about that. You’ve certainly got to be preaching about families and neighborhoods. Those are worldview issues. We’ve got to be preaching about political decisions that are clearly moral. We shouldn’t preach about ones that aren’t moral or that don’t touch upon serious moral questions. But I see the job of the pastor is to be the interpreter of biblical truth to the laity so the laity are informed in such a way that they can live out their faith—Ephesians 4—and become ministers themselves of the message that comes from the pulpit. Preaching: We’re in an election year, and there is a constant effort by candidates to try to pull congregations into political campaigns. How should a pastor deal with that? Colson: I wrote a book a number of years ago called Kingdoms in Conflict [recently revised and re-released as God & Government], which described the proper role of Christians in politics. I said it is wrong for Christians to allow themselves to become a special-interest group or a power block and thereby bargain to put themselves in the hip pocket of a political party or movement. It is equally wrong to ignore politics because we have to care deeply about it, but we stand independent of and apart from a specific political movement. So it’s a balancing act because, of course, if you have one party that is clearly pro-life—or at least confesses to be and most of its candidates are—and one party that has very few pro-life candidates and no pro-life plank, you’re automatically gravitating toward the one who is pro-life. But you have to be very careful that you don’t simply put yourself in bed with any one party or movement. The life issue to me is transcendent because I think it goes to the very heart of the gospel. Pope John Paul II wrote an encyclical called Evangelium Vitae in which he said that dignity of human life is a part of the gospel. Some of us evangelicals believe that it is integral to the gospel. But either way you look at it, when someone is taking away life from the moment of conception to natural death—threatening life—they’re threatening what it means to be human. And they’re threatening the very nature of the gospel. Preaching: From your perspective, are there some areas where preachers need to be cautious? Are there lines that they ought never step over? Colson: I’ve never endorsed a political candidate, and preachers should not endorse a specific candidate or party. To say from the pulpit, "Go vote for X or Y or this person or that person" would be a serious mistake. To explain what the candidates’ positions are on crucial issues is entirely appropriate, but I think you have to be very careful that you don’t allow yourself to be an instrument of partisan politics in the pulpit. We need to talk about the issues—the law, music, medicine, caring about the poor—a whole range of issues that as Christians we care deeply about. They are fair game in the pulpit and fair game in the church. But partisanship is not. Preaching: You have a new book that’s just recently out called The Faith, which talks about what we believe and why it matters. Why does belief matter in a post-modern culture that asserts you can believe whatever you want as long as you’re really sincere? Colson: It’s so important that Christians learn what they believe, why they believe it and why it matters. It matters deeply because basically Christianity is God incarnate, God coming as man in the flesh. But it is also biblical revelation and the way in which that biblical story has been handed to us by the apostles. It is truth, and if we shortchange it—if we do not preach the whole gospel—if we do not ground people in their fundamental beliefs that make them Christian, then we’re going to see exactly what has happened today. That is, the church loses its potency. It no longer impacts society. It no longer can define itself. It’s being defined by the world around us. Christianity is being defined today by the atheists and anti-theists, as they call themselves—Dawkins, Hitchens, Sam Harris … that whole crowd—who are selling books by the millions. It’s being defined by people who write books labeling us as theocrats, which is absolutely the opposite of what Christians believe. We do not believe in a church-state. Every time there has been a church-state, it has been grief. Luther famously said you cannot coerce conversion. So we don’t want political power in the church. But all of these stereotypes are being developed in the media and believed by people because we don’t know enough about our own belief system to be able to defend it or be able to live it. That’s why I wrote the book called The Faith—the subtitle is actually Given Once for All, right from Jude 1:3 in which Jude is saying, "Contend for the faith that was entrusted once for all to the saints." So it’s an appeal—if I dare use this word in today’s culture—for orthodox, biblical faith, for the real stuff, not for some of the failed substitutes that people are trying and conversations they want to have in meeting halls. No, this is for taking a hard look at what I’ve labeled 14 critical truths that make you a Christian, and I think Christians need to be well grounded in what they believe so they can defend it. Preaching: As preachers, as the church, we make truth claims. Yet many in this culture argue there’s no basis for such claims—that "your truth is your truth, my truth is something else." How do we cut through that intellectual clutter to press truth claims within this kind of culture? Colson: Sometimes what you have to do is illustrate them in a very simple way. I get a lot of students who come to work in our ministry in the summer as interns, most of them from Christian colleges. I’ll do the same thing with every group every summer when I get them together. I’ll say, "How many of you believe there is such a thing as absolute truth?" And you’ll see them kind of shift uncomfortably in the chair and look at their neighbor; nobody really wants to be first to raise his hand. I’ll say, "Well, I realize that’s a politically incorrect question, but let me ask you a practical question. If you were standing on a street corner and saw an old lady standing there with shopping bags, the traffic is whizzing by in all directions. You’ve got three choices. You can help her across the street. You could ignore her. Or you could push her into the traffic. Which is wrong?" And of course, the kids all chuckle. And after I do that then I say, "Now how many of you believe in absolute moral truth?" and the hands all shoot up. Of course! The truth is written on the human heart. Paul in Romans 2 makes it so clear. Paul makes it so clear in Romans 1 that people are without excuse because that which has been made has been made known to them. So we see it in what earlier generations of evangelicals called "The Book of Nature." We see it in nature. We know it’s written on the heart. And you can teach someone to answer the great questions of life: "Where do we come from? Why is there sin and suffering? What is the answer? Is there hope? What’s our purpose?" You can answer those—creation, fall, redemption, restoration—you can take that four-part grid. You can apply it to every other religion, every other worldview and see which ones rationally answer those questions. The only one that does is the Christian worldview. My contention is if you empirically study how various religious and secular belief systems work out in practice—this is something Cornelius Van Til, a great preacher, once wrote—you’ll see that the only one that is rational is the Christian worldview, and all others fail. So what’s a truth claim? People make truth claims every day even if they say truth is simply subjective. We make them all the time. The problem is we have so exalted tolerance as almost our supreme virtue that we’re afraid to even say the obvious. I’ve found with kids, when you start working this through with them, all of a sudden their eyes brighten. I’ve been teaching the knowability of truth for years and have found a great response. Evangelicals need to be shaken out of their comfortable, lethargic accommodation of the culture and realize that we have something to say, which is a truth claim and has been since the beginning. And it’s not wrong to make truth claims. But it’s dead wrong to disrespect someone’s truth claim. Preaching: One of the critical things the church needs to be doing today is helping people to develop a Christian worldview—to learn to think Christianly. Do you have some counsel to pastors about ways they can help their own congregations to develop a Christian worldview as they are listening to sermons? Colson: We truncate Christianity. We reduce it to something easy and manageable—it’s a relationship with Jesus, and that’s all the matters. I’ve got my relationship with Jesus, and you’ve got yours. It isn’t [easy and manageable]. It’s an overarching view of all reality. And therefore, as I quoted Kuyper earlier, every square inch in the whole dominion of human existence, He claims. So we’ve got to begin to see the whole world through a Christian lens. I wrote a book called How Now Shall We Live? a number of years ago that takes those four questions and dissects them and shows how all other worldviews compare. I think if you read that book you’ll come away convinced that the biblical worldview is sound and makes sense. So pastors can introduce books like that. They can introduce The Truth Project, which is done by Focus on the Family—an excellent resource. They can enroll in one of our courses. Rick Warren and I did a wide-angle course on the biblical worldview. It’s sort of a shortened course in six sessions. We were the unlikely pair—me, the Ivy-educated, pin-stripe suit, blue blazer, and Rick with his Hawaiian shirt and no socks. Preaching: Rick doesn’t own too many pin stripes. Colson: No (laughter). We did a very good series that’s had a really good ministry—a good life. It’s being used in churches. We have Web sites at Breakpoint.org or Prisonfellowship.org. You can learn about what’s called The Wilberforce Forum, where we teach biblical worldview. We teach it on an annual basis to a hundred centurions. We’ve turned out 400 graduates so far, most of whom are teaching biblical worldview. So one thing a pastor could do is send somebody from his church to the Centurions Program and then tell them to come back and teach it in the church. Pastors are very busy. I know the pressures that are on my pastor. But you can assign laypeople the task of reading these books, preparing themselves and equipping themselves and then set them up to be teachers inside the church. Preaching: In addition to your own pastor, who are some of the preachers you enjoy hearing? Colson: Oh my, I love to listen to Alistair Begg. He’s one of my favorites. Ravi Zacharias is wonderful. He’s more than a preacher. He’s an apologist. Charles Stanley is a magnificent preacher. I shouldn’t start the list because I’m going to leave out at least 20 people. Joe Stoll—who has just left a church in Chicago and gone over to Cornerstone—is one of the great preachers in America. He’s one of the most articulate defenders of the faith. We’ve got really a great cadre of frontline preachers across America. Preaching: Do you have any words of counsel to pastors out of your own experience, out of the work you’ve done? Colson: The principle thing I have to say to them—but you’d also have to say it to their lay-leadership—is to worry more about spiritual depth than church growth. There’s too much recruitment going on just to get people in the church. And I think pastors most often suffer because they’re under pressure from their own leadership, their deacons and elders. It’s the people who want the biggest church in town more than the pastor. So I would simply say: focus on making disciples, transforming them. Bill Hybels announced recently that he had failed over all the years of the Willow Creek movement because they hadn’t made disciples. They had brought people into the church, but they hadn’t been transformed. It was a very courageous thing he did. He’s using my new book, The Faith, to catechize his congregations. Rick Warren is emphatic about the need for discipleship and deepening faith and small groups, study groups. I think there’s a real sense of unease in the church today that we’ve got lots of numbers, but we don’t have people who are really change agents and who are really witnesses of transformed lives. One thing we’ve done at Prison Fellowship is we’ve redone our vision, mission and values statements to reflect not just reaching as many people in the prison with the gospel as we can but to really make disciples—to see them become transformed. Transformational discipleship is a buzzword that I would love to see the church pick up. My advice to any pastor would be to work on spiritual depth. Growth will come, but depth has to be the most important thing.